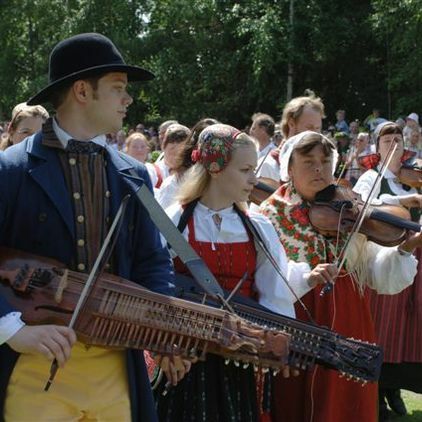 Every year, in the month of June, Skansen celebrates the year’s most love-filled day. In 2019 it will be at June 15th.You are welcome to marry outdoors at the lovely Tingsvallen – and you don’t even need to book! The special ‘Wedding Entrance’ for couples wanting to get married is open from ten in the morning until three in the afternoon (10.00 – 15.00), but the ceremonies continue until everyone who has passed the Wedding Entrance before 15.00 has been married. The marriage ceremony can be held in English if desired. The Tingsvallen is a grassy meadow that goes from the Bollnäs square to the Delsbo farmstead. Here the raising of the maypole takes place every summer. Take your loved one in hand and come tie the knot! All you need to bring is a valid ID, and a so-called ‘hindersprövning’ which guarantees that there is no legal impediment to the marriage. If you want a church wedding, you also need a form from the parish where you live. If you are not a resident in Sweden or are not a Swedish citizen, it is extremely important that you check with the authorities on the rules that apply in your native country. Officiants are available for celebrating both civil and church weddings. The ceremonies take about ten minutes. There is a fee of 1200 SEK for each couple. Children up to the age of 15 can enter Skansen through the Wedding Entrance where they pay the usual fee. Adult wedding guests use the normal entrances to Skansen and pay the regular admission fee. Wedding couples as well as their guests can purchase tickets in advance at the Skansen ticket shop. In the wedding area you will find photographers, florists, make-up artist, nail stylist, and many other services. There is also a champagne bar where you can buy drinks and a song tent where the couples can choose their favorite love song to be played by our special wedding band. Also, Skansen’s fiddlers play traditional Swedish folk music on the dance floor at Bollnästorget. Skansen’s restaurants have special wedding menus and people who want to enjoy the fresh air can order picnic baskets. Coffee and strawberries are also available. Here’s how it works! Wedding couples are given a numbered ticket when they enter the Wedding Entrance with one series of numbers for civil weddings, and another series for church weddings. When you have your queue ticket, you go to the wedding site where there are twelve wedding tents, all prepared with an officiant and witnesses. When your number is called you enter the "queue tent" where our staff will take care of you. Your guests line up along side the queue tent. Don’t worry about missing your call. You won’t have to go to the back of the queue! You just have to wait a little longer. As long as you get to the Wedding Entrance before three in the afternoon, we can guarantee that you will go home as a married couple.